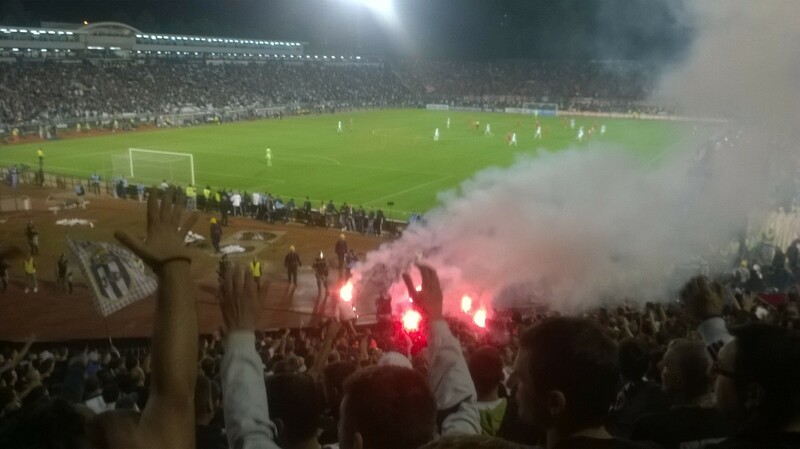 Last November I visited Serbia for the first time to attend Red Star vs. Partizan, witnessing parachuting fans, a stadium set alight and the kind of madness that would be dismissed as unrealistic in a Hollywood movie. I soon fell in love with the country, the people and the complete insanity of this fixture, and knew I would return at the next possible chance. 11 months later, it was time to go back. The ringing of a church bell is interrupted by the buzz of a police helicopter, swooping low over the stadium on the lookout for any signs of trouble. With what happened at the very same arena just a few days ago, it is perhaps no surprise that tensions are high. On that occasion it was a much smaller object flying over the pitch which was to be the spark for insanity, as the Euro 2016 qualifier between Serbia vs. Albania was interrupted by a drone carrying a flag which was deeply offensive to Serbians and many of the other Balkan nations. When a Serbian player attempted to remove this flag to prevent the riot that was threatening to break out, he was attacked by an Albanian player looking to defend the flag. Any shred of calm which remained inside the stadium was lost, and all hell breaks loose. Fireworks and flares are thrown onto the pitch and Serbian supporters charge onto the field to join in the melee, which now involved pretty much everyone from the players to the kitmen. If international football had tea ladies, they would probably have been throwing kettles at each other over the heads of the riot police. The situation eventually calmed down to the point where it looked as though the game could restart, but the Albanian players refused to continue and the game was abandoned. It is still not clear what UEFA will decide as to the final result of the game (which had been 0 – 0), but it is believed that a 3 – 0 victory will be awarded to Albania. This was certainly the belief of the Albanian supporters who had been banned from the contest, and instead flocked to the airport to welcome back their players as returning heroes. The situation turned darker still when it was revealed that the brother of the Albanian Prime Minister had been arrested after it was discovered he had piloted the drone over the stadium. With the memory of this carnage and the already intense political situation it had made even worse, a game between these two rivals was probably the last thing the Serbian authorities had wanted. The number of police officers inside and outside of the stadium had been huge last time I went to see this game, and there were at least double that number on this occasion. It had been rumoured that the ultras of both sides would unite for this game to sing pro-Serbian songs and show their defiance to what had happened earlier in the week, but in reality the feelings of hatred are just too strong. These two teams could play each other in the middle of the zombie apocalypse, and they would still hate each other more than the zombies. There were some signs of what had gone before however. 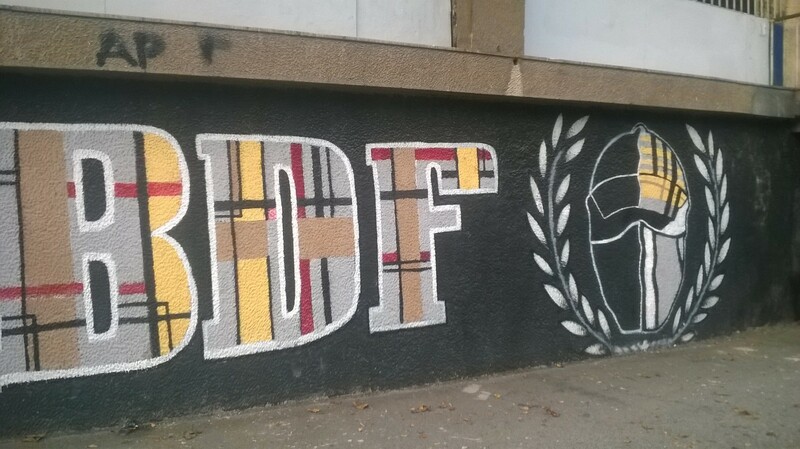 At the last derby there had only been Red Star and Partizan flags or banners on display, but this time there were noticeably more flags related to Serbia and the situation in Kosovo in particular. All thoughts of unity quickly went out of the window, as the Zvezda supporters flocking into the overcrowded away section realised they needed more room. Flares and fireworks were thrown over the wall into the section next to them, intended to send the police in this section backwards. It worked, and soon there was another block filled with visiting fans. It was the first time Red Star had come to the home of their rivals as champions for almost a decade, and they were fully intent on enjoying it. With these big derbies around Europe, winning the football match is only half of the battle, it’s also all about what you do in the stands. The first blow would be struck by Delije, who lit up the night sky with a huge display of pyro, first lighting hundreds of flares before unleashing scores of smokebombs, leaving a huge red cloud over the stadium for several minutes. After several minutes of waving these flags, it was time for the first delay of the game. Huge numbers of white smokebombs were set off, making it completely impossible to see anything other than the maniacs leaping up and down in the two or three rows in front of you. This smoke drifted across the pitch, covering the field so completely that had an Albanian drone chosen to fly past at that moment, nobody would ever have been able to see it anyway. This lifted the atmosphere further still on both sides, with the Grobari chanting “Cigani” at the visiting Red Star supporters, which translates to English as “gypsies”. Zvezda returned with one of their most famous chants “Indija, Pakistan”, which suggests that Serbians support Red Star, while Partizan’s support comes from elsewhere. The Grobari did not seem too upset by this suggestion, as they actually sang the song with slightly different words themselves in response. As I mentioned in my last report on this game, it is sometimes difficult to remember that there is actually a football match going on. This was a huge match in the race for the title, despite the fact that it was only the 8th game of the season. 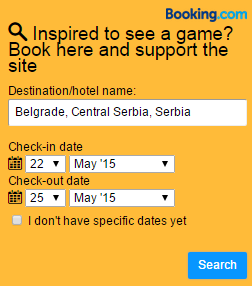 Partizan were one point ahead of Red Star going in to the game, but crucially they had played one game less. That meant with a win they would go four points clear with a game in hand, a fixture they would be very likely to win due to how weak most of the other sides in Serbia are in comparison to the big two. Even with many months left of the season, it would be hard for Red Star to recapture their title if they were to fall this far behind. The players were clearly fully aware of the magnitude of this game, not just for bragging rights but in terms of tasting success at the end of the season. This lead to the match being extremely tight, with only a couple of chances in the first half for either side. Partizan probably had slightly more of the ball (I’ve gone 25 years without looking up possession statistics, and I’m not about to start now), but Zvezda did come close on a couple of occasions, one in particular where the ball went behind the goal before bouncing into the back of the netting, tricking some inside the stadium into believing it was a goal. It inspired the away stand into joining arms and bouncing up and down as one, a fearsome sight which looked as if it could turn the North stand into rubble. Never to be outdone, the Partizan supporters performed their own bounce, leading to perhaps my most nervous moment inside a football stadium on one of my trips yet. I was stood next to a rather attractive girl, who was at the match with her giant boyfriend. I put my arm round her with the enthusiasm of a child forced to hug their grandmother, making sure not to let my hand slip in a way which would result in me being set on fire and thrown on the pitch. Of course Serbians are so welcome to visitors that there was no real danger but still, it’s always better to be safe than sorry! Speaking of things being set on fire, this was done frequently throughout the match, with both sides burning flags, scarves and shirts which had been stolen from rival supporters before the game or at previous derbies. These burnings would take place at the front of the stand, with the arsonists sat on the fence and waving the burning object tauntingly at their opposition. Once it became too engulfed in flame to hold, it would be thrown to the ground (or at one of the police officers), and quickly be extinguished by one of the many firemen on duty at the game. Half time arrived with the score something like Partizan Belgrade 0 – Red Star Belgrade 0 – Things set on fire 10,000, a fair reflection of how things had gone so far. 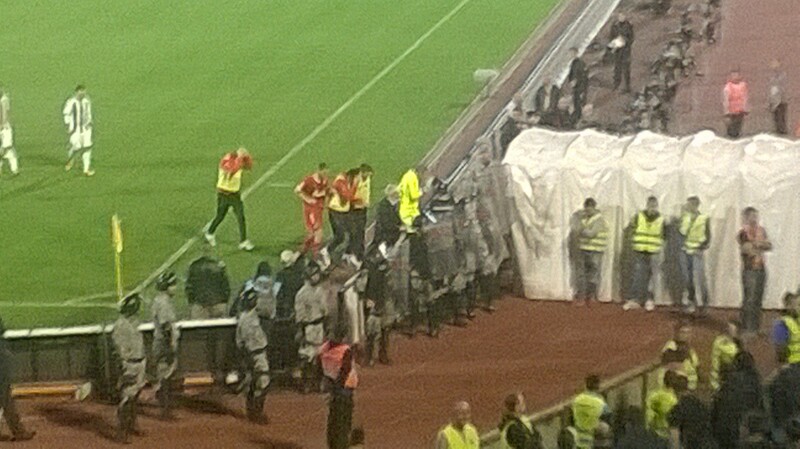 The Zvezda players scurried for the tunnel, dodging coins, lighters and various other missiles which were thrown their way, despite the best efforts of the police wielding riot shields above their heads to block the debris. Knowing that they could almost begin to celebrate a championship with a victory, the Partizan fans upped their game in the second half. Winning the title is more important than ever for Partizan this year, as the victory by Red Star last season meant that they had lifted the trophy a combined number of 26 times, while Partizan are on 25. These victories came in the league of Yugoslavia, Serbia and Montenegro and now finally Serbia alone, the competition they compete in changing in a way that the hatred between them never could. The South stand of the stadium divided into three sections, each one chanting one part of the song, being leaving it to be continued by the next section. Not only were the fans competing against Zvezda now, but also themselves, as each section wanted to be louder than the one before. Leading members of the Grobar waved their arms to inspire louder noise, sending telling glances in the direction of anyone they felt wasn’t singing enough. The chant spread all the way from the South stand across to the West, with these supposedly calmer fans going just as wild as those packed into the South. I could not understand the first part of the chant, but “PARTIZAN CHAMPIONS” was fairly difficult to miss. Urged on by the noise, Partizan began to show why they are top of the league, getting a stronger hold on the game and starting to put real pressure on champions Zvezda. The Grobari responded to this improved level of effort from their players in style, as it seemed like almost everyone in the stand pulled out a flare they had been hiding somewhere. The stand is known locally as ‘The Jug’, and it would have taken a thousand jugs of water to put out the huge swathes of flames which erupted across the stand. Once again the game was stopped for several minutes, the referee waiting for the smoke to clear sufficiently that the game could continue. Even when it did get back underway, it was still difficult to make out the players for some time as they ran in and out of the plumes of smoke. The home side were well on top now and indeed, with about 20 minutes to go it looked as if they had opened the scoring, the ball being smashed towards goal and the Partizan fans celebrating wildly for a couple of seconds. However, it turned out that the ball had not gone in after all, the smoke from the flares being used by Delije and the distance of the opposition goal had simply created the impression it was in. They would not have to wait much longer. 77 minutes on the clock, and Partizan win a free kick in a fairly dangerous position. It feels as though a cross is the best option, but instead Nikola Drincic had glory on his mind. It was a wise choice, the ball flying into the net and for the second time in a week, the home of Partizan Belgrade erupted into madness. The difference this time is that it was with joy, rather than rage. Every single Partizan player ran the length of the field to celebrate with their supporters, shoving riot police out of the way to jump into the stand with the people who had been supporting them so passionately. The Red Star players meanwhile sank to the turf in despair, knowing that they had 13 minutes left to possibly save their season. It seemed impossible that there could be any more flares left in the stadium after how many had been set off already, but still there was time for the sky to be filled with fire one more time, as an explosion of joy echoed round the intimidating arena. Meanwhile Delije reacted to the goal in their own way, supporting the team even louder than they had done before, trying to urge them on to an equaliser. With Partizan trying to run out the clock, flares began to make their way onto the pitch, although nowhere near in the same numbers as when Albania had come to town. The match was not even interrupted for this, with firemen sprinting onto the field to remove the flaming objects, before dunking them into the large buckets of water which had been prepared well in advance. Next year will see the 150th meeting of these sides, and there are few people left who do not know to expect total chaos whenever they collide. The clock reached 90 minutes, but in reality there was still a long time to go – the match had been paused twice for smoke in the second half, while the goal celebrations had also taken up a number of minutes. Zvezda were pushing hard, and one of their players produced the best moment of skill in the game to leave several defenders helpless. He should have cut the ball across the box, but instead fired at the keeper. The Grobari held their breath, before roaring with delight as their keeper initially fumbled the ball, before taking it firmly in his grasp. Just to make sure, he then jumped to the ground and held on to it for as long as possible. There’s no time for sportsmanship in the Eternal derby, after all. At last the whistle blows, and the joyous celebrations can really begin. While the Zvezda players walk over to the away stand to applaud their fans and hand them their shirts, the Partizan players stand in front of the Grobari in the middle of the Jug, pumping the air with their fists and joining in the songs. Surprisingly, many of the team even joined in with a song about being the champions, although some of the older and wiser players clearly refrained from this one – even in a strong position just as this, there’s no need to go tempting fate. The party went on and on as Partizan tasted the sweet success of victory, while Delije continued to chant in defiance on the opposite side of the stadium. As the supporters finally trooped away into the night, still singing the songs of triumph, I was glad that the world had been reminded of what Serbian football is really like. It may have more controversy, mayhem and scandal in a year than other leagues do in a decade, but when it comes to passion, undying loyalty and dedication, there are few countries that can match them. When it comes to derby fixtures which can match this one, there are even less that even come close. Whatever happens to Serbia when UEFA meets to decide their punishment in the coming weeks, it should not distract from what a wonderful country this is to visit, and what an incomparable experience watching the derby is. I am proud to call so many Serbians my friends, and I met many new great people on this trip. There are still many issues and tensions within Serbia, it is perhaps no surprise when you consider the recent history of the nation and the surrounding countries. The fact remains, if you knew you could only ever watch one football match again for the rest of your life, it should be this one. 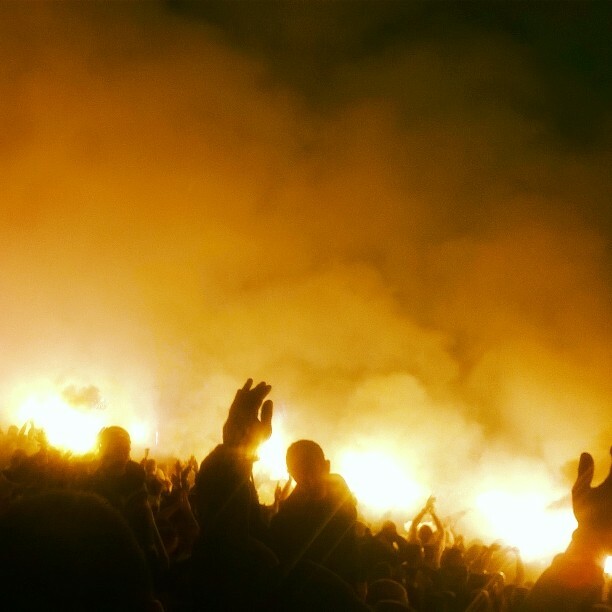 Partizan supporters can walk taller in Belgrade for now, but the fire of the Eternal Derby burns on. Posted on October 19, 2014, in General. Bookmark the permalink. 5 Comments. Hi, I’m booking up for this for Aprils game. What’s the score with match tickets? Any help would be appreciated.